Truong Hoa Binh praised, highly appreciated the achievement in socio-economic development which Quang Ngai province achieved. Especially, the local authority cared, supported and took care the ethnic minority people’s lives which brought practical results: ethnic minority people’s living standard has been improved, the annual poor rate has been decreased. These make contribution to the general achievement of entire country. Beside the achieved results, there are some drawbacks such as: the rate of poor households in ethnic minority community still high – over 51,46%; the economic models in ethnic minority area are small, etc. To achieve the socio-economic goal, the Deputy Prime Minister suggested the authority needs to focus on investing, having policies for younger generations which are ethnic minority children to promote human resource, developing the production, focusing more on poverty reduction tasks, building infrastructures, launching suitable economic models, attracting investment to mountainous districts, pushing the job training, creating job and labor export pportunities; upgrading the quality of medical service, insurance policies for ethnic minority people; drastically preventing the child marriage and near-blood relationship marriage; perserving the beauty of traditional culture; promoting the role of influential individual, village patriarch, village leader; attaching special importance to searching, cultivating and arranging ethnic minority cadres working at mountainous district. 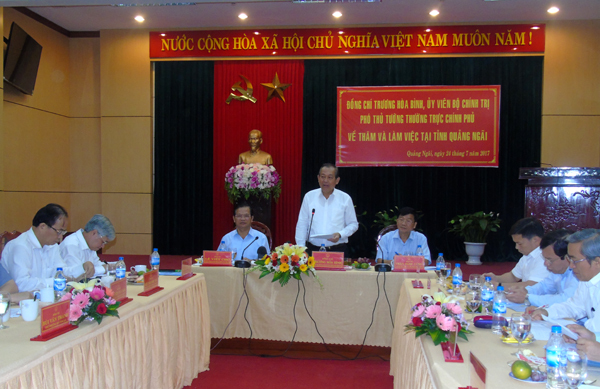 Addressing in the working session with Quang Ngai province, the Minister, Chairman of Committee for Ethnic Minority Affairs Do Van Chien also acknowledged the effort of Quang Ngai’s agencies in executing ethnic tasks. Quang Ngai drastically executed policies lifting ethnic minority people out of poverty in sustainable way, household having good business will be praised to encourage people. This is a good method that needs to be promoted. The Minister, Chairman Do Van Chien suggested Quang Ngai increases and arranges more ethnic minority cadres in fundamental positions in mountainous districts.